The Forum has been busy over the last couple of months reviewing the feedback from the Community obtained from Open Day and Special Interest Group meetings. Before we formally submit the Neighbourhood Plan for Inspection we intend to seek comments, additions and/or endorsement of these initial ideas to ensure we are heading in the right direction. Between now and mid-July we intend to bring the plan to local community events around Adel and seek the thoughts and views of the community. Look out for the Neighbourhood Forum’s stand at these events as this is an opportunity for you to influence the Plan. The heart of the Plan will set out the vision, core objectives and policies for Adel, the following suggestions give a flavour of our thinking. As an illustration some of the proposed CORE OBJECTIVES are set out below under the key issues. These are the foundation for the planning policies which will flow from them. • to preserve and enhance the key heritage assets of Adel and to enhance the identity of Adel with local green space. • to ensure that Adel has a recognised community centre or centres that can provide for a range of community provision extending and enhancing what is currently provided. • to support and develop a thriving shops and services sector of physical businesses, with particular emphasis on those that are in keeping with the character of Adel, that offer relevant and appropriate services. 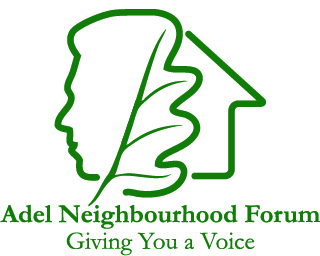 Once the Neighbourhood Plan is endorsed, the Neighbourhood Forum’s role will be to ensure that any proposed development fits with the planning policies that have been agreed.